I went shopping at Target for costumes and couldn't believe how much they were!!! So I decided to make them cheap! My 2 youngest kids have autism and are obsessed with their favorite characters, so I decided to make two that I could make fairly easy. My daughter loves unicorns and my son loves Bendy from Bendy and the Ink Machine. For Bendy, I got cardboard I had, duck tape from the dollar store and fabric from Walmart. We had the gloves on hand, as well as the black clothes. I was able to make the mask and tie completely from cardboard, duck tape, and felt. He turned out amazing!!! 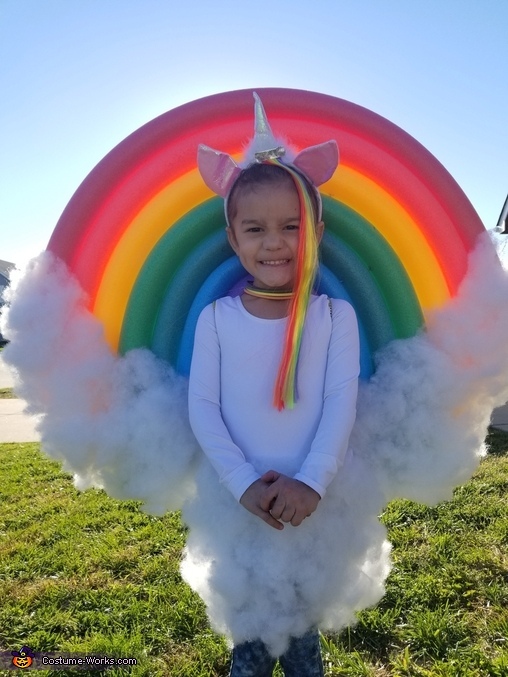 I made my daughter's unicorn from a cheap headband set at Walmart with clothes we had. I was going to make the rainbow from felt but decided to go with pool noodles as they were $.60 from Target. I got each color and connected the end with zip ties from Dollar Tree. Then bought an adhesive spray and fabric stuffing on clearance from Walmart and covered the ends of the pool noodles. I stuck kabob sticks into the rainbow to help them stay lined up and was able to attach mini stretch cords around one of the kabob sticks and my daughter was able to wear the rainbow like a backpack! This costume was around $10 for the both of them and they are by far the best costumes they've ever had!!! I am super proud of how amazing they turned out and they are completely solid pieces!